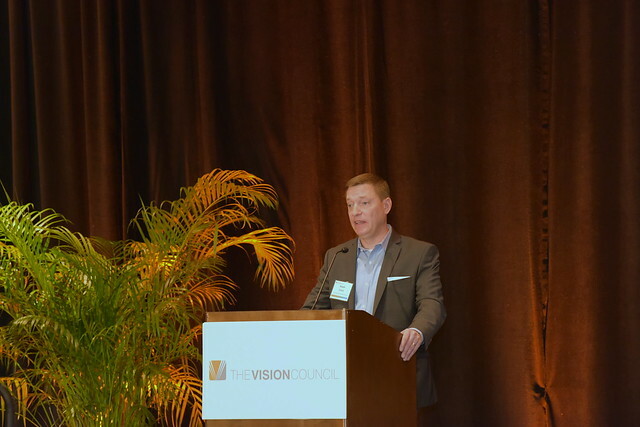 The Vision Council's 2019 Executive Summit held Jan. 30 - Feb. 1 at the Ritz-Carlton, Grande Lakes, Orlando, Florida, presented attendees with an exclusive event filled with opportunities for executive-level networking, leadership development, economic trends and business strategies within the theme of "Contagious Leadership – Strategies for Cultivating People While Producing Business Results." Attendees heard concepts presented by key thought leaders, attended Division and Committee meetings, participated in engaging and provocative workshops and approved new members to The Vision Council's Board of Directors. Keynote speaker George Blankenship, former executive at Tesla Motors, Apple Computer and GAP Inc., offered attendees a unique perspective on how organizations within the industry can adapt to an ever-changing marketplace. Additional keynote speakers included Jeff Cherry, an expert on the topic of Conscious Capitalism; Liz Wiseman author of the business leadership book, Multipliers; and Brian Beaulieu, CEO and chief economist of ITR Economics. To download select keynote presentations, please login here. View the complete list of registered attendees here. Former executive at Tesla Motors, Apple Computer and GAP Inc., George Blankenship brings 30 years of international strategy, retail and real estate experience to his audiences. In his executive capacities at Tesla Motors, Blankenship successively served as vice president of design and store development, vice president of worldwide sales and ownership experience, and vice president of worldwide retail. In these roles, he redefined the car-buying experience, and in turn revolutionized the auto industry. For the last 30 years, Gallup has surveyed employee engagement locally and globally. Their reports yield consistently unfavorable results stating that 85% of employees worldwide are not engaged or are actively disengaged in their job. That means that the majority of employees – those sitting in your office right now – simply don't care, or worse, are actively attempting to sabotage your organization. We suggest that this state of affairs is largely driven by the way we collectively view the purpose of business: as a tool to enrich shareholders with a primary focus on monetary success. However, there are massive societal and market forces at play today that are changing the way we decide whom we want to work for, buy from, partner with, and invest in. These forces are bringing forth a new narrative about the purpose of business and a new movement called, Conscious Capitalism. The companies that are equipped to leverage these forces, by operating with a stakeholder as opposed to myopic shareholder mindset, will shift the engagement dynamic and be the winning companies of the future. We'll explore the history that started us down this road of disengagement, the elements that are changing the relationship between business and society, the emergence of Conscious Capitalism, and the tools at your disposal to profit from passion and purpose. We've all had experience with two dramatically different types of leaders. The first type drains intelligence, energy, and capability from the people around them and always needs to be the smartest person in the room. These are the idea killers, the energy sappers, the diminishers of talent and commitment. On the other side of the spectrum are leaders who use their intelligence to amplify the smarts and capabilities of the people around them. When these leaders walk into a room, light bulbs go off over people's heads; ideas flow and problems get solved. These are the leaders who inspire employees to stretch themselves and get more from other people. These are the Multipliers. And the world needs more of them, especially now when leaders are expected to do more with less. In this highly engaging talk, Liz Wiseman will share the research behind Multipliers and illustrate the resoundingly positive and profitable effect these Multipliers have on organizations – how they get more done with fewer resources, develop and attract talent, and cultivate new ideas and energy to drive organizational change and innovation. She'll introduce the five disciplines that distinguish Multipliers from Diminishers and provide practice tips for leading like a Multiplier. What could your organization accomplish with access to all the intelligence that sits inside it? Brian will share quick forecasts for the next few years and the associated Make Your Move Moments – an all-time crowd favorite! You won't want to miss Brian's recap of an interesting and active 2018, the economic indicators, trade policies, and the short and long term impacts. Brian will conclude with his outlook for 2019 and beyond and host an always lively Q&A. James Chen, Eye-care philanthropist and founder of international eye-care initiative Clearly in conversation with Mike Hundert, Immediate Past Chairman of The Vision Council. Save the date for the 2020 Executive Summit! Click on the photo below to view the full album and check back later for more photos!